S I G N & D I G I T A L G R A P H I C S • June 2018 • 9 Monthly News Roundup B Y T O N Y K I N D E L S P I R E J U N E 2 0 1 8 Get the latest industry news from Tony Kindelspire five days a week by signing up for our eNewsletter at sdgmag. com. Look for the red "Get the eNewsletter" button on the home page. Have industry news to submit? Contact Tony at tkindelspire@ nbm.com. 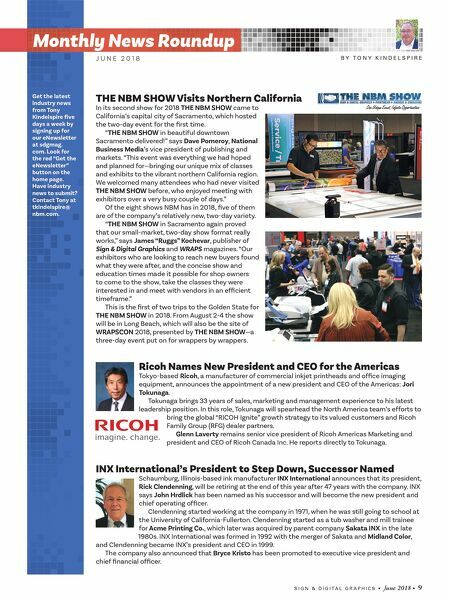 THE NBM SHOW Visits Northern California In its second show for 2018 THE NBM SHOW came to California's capital city of Sacramento, which hosted the two-day event for the first time. "THE NBM SHOW in beautiful downtown Sacramento delivered!" says Dave Pomeroy, National Business Media's vice president of publishing and markets. "This event was everything we had hoped and planned for—bringing our unique mix of classes and exhibits to the vibrant northern California region. We welcomed many attendees who had never visited THE NBM SHOW before, who enjoyed meeting with exhibitors over a very busy couple of days." Of the eight shows NBM has in 2018, five of them are of the company's relatively new, two-day variety. 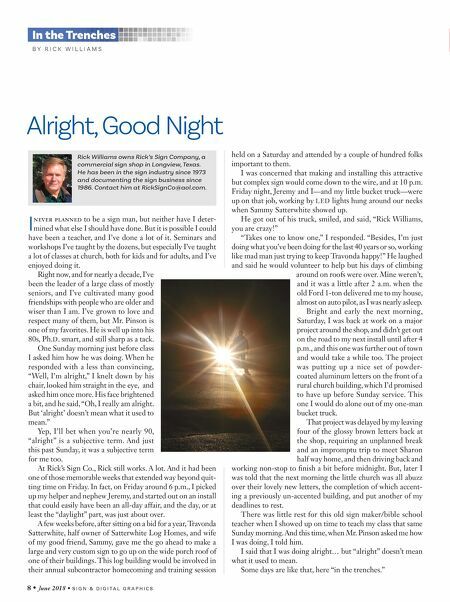 "THE NBM SHOW in Sacramento again proved that our small-market, two-day show format really works," says James "Ruggs" Kochevar, publisher of Sign & Digital Graphics and WRAPS magazines. "Our exhibitors who are looking to reach new buyers found what they were after, and the concise show and education times made it possible for shop owners to come to the show, take the classes they were interested in and meet with vendors in an efficient timeframe." This is the first of two trips to the Golden State for THE NBM SHOW in 2018. From August 2-4 the show will be in Long Beach, which will also be the site of WRAPSCON 2018, presented by THE NBM SHOW—a three-day event put on for wrappers by wrappers. Ricoh Names New President and CEO for the Americas Tokyo-based Ricoh, a manufacturer of commercial inkjet printheads and office imaging equipment, announces the appointment of a new president and CEO of the Americas: Jori Tokunaga. Tokunaga brings 33 years of sales, marketing and management experience to his latest leadership position. In this role, Tokunaga will spearhead the North America team's efforts to bring the global "RICOH Ignite" growth strategy to its valued customers and Ricoh Family Group (RFG) dealer partners. Glenn Laverty remains senior vice president of Ricoh Americas Marketing and president and CEO of Ricoh Canada Inc. He reports directly to Tokunaga. INX International's President to Step Down, Successor Named Schaumburg, Illinois-based ink manufacturer INX International announces that its president, Rick Clendenning, will be retiring at the end of this year after 47 years with the company. INX says John Hrdlick has been named as his successor and will become the new president and chief operating officer. Clendenning started working at the company in 1971, when he was still going to school at the University of California-Fullerton. Clendenning started as a tub washer and mill trainee for Acme Printing Co., which later was acquired by parent company Sakata INX in the late 1980s. INX International was formed in 1992 with the merger of Sakata and Midland Color, and Clendenning became INX's president and CEO in 1999. The company also announced that Bryce Kristo has been promoted to executive vice president and chief financial officer.